HWFA sponsored the 2018 Milestones Autism Resources Annual Benefit. Pictured are Steve Rudolph, Marla & Craig Petti. Steve Rudolph, Craig Petti and Marla Petti represented HWFA at the Milestones Autism Organization Strike it Big Bowling event this month. The HWFA bowling team, Split Happens had a great time supporting an organization that helps meet the everyday challenges that impact families dealing with autism. 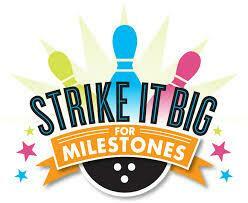 HWFA teamed up with Autism organization Striking It Big for Milestones for its 6th annual bowling extravaganza. Learn more about our cause and how you can donate to our team "Split Happens". 4,500 pounds of bread and pastries. We look forward to our next visit. HW Financial Advisors is proud to announce their support in the 2017 Benefit for Milestones Autism Resources. To learn more about this event or organization please visit their site. Visit our Community Archive page to view past events.